George Soros is back, and that's not a good sign for the global economy. Billionaire George Soros sees an economic storm gathering. Image source: Flickr/Carl Milner. George Soros doesn't like what he sees in today's global economy. The billionaire investor, who is estimated to have a $25 billion net worth, has made his position clear this year in quotes, stock picks, and other portfolio holdings. He thinks the economy is in trouble, and he's putting his money where his mouth is. To understand what he's doing and why, let's break down what he's said about today's market and how he has positioned his fund to capitalize on these trends. The last time George Soros took an active role in the day-to-day trading at his firm, Soros Fund Management LLC, was in 2007. At that time, he stepped in to bet against the housing market, a move that would eventually net the firm over $1 billion in profits at a time when the rest of the financial system teetered on the edge of collapse. His views today are once again bearish, though this time he sees problems coming from abroad, rather than at home. The biggest problem, in his view, comes from China. He told The Wall Street Journal: "China continues to suffer from capital flight and has been depleting its foreign currency reserves while other Asian countries have been accumulating foreign currency. ... China is facing internal conflict within its political leadership, and over the coming year this will complicate its ability to deal with financial issues." More tangibly, Soros sees Chinese problems as a catalyst for deflationary pressure that could spread around the world, causing havoc in all major economies. He's also pessimistic about the European economic-political situation, with continued concerns over Greece, the ongoing migration crisis politically dividing the region, and the possible British exit from the euro. According to Soros, the political discord coupled with an economic shock from the so-called "Brexit" could be enough to collapse the eurozone. He said, "If Britain leaves, it could unleash a general exodus, and the disintegration of the European Union will become practically unavoidable." At this point, however, most experts predict that Britain will remain in the euro economic zone. Soros recognizes this, citing strength in the British pound as a sign the country will remain. Even so, the problems are sufficient in his mind to take a bearish position with his billions of stock holdings. Soros has always been one to back up his opinions with his cash, and today is no different. In the first quarter he purchased over 19 million shares of gold miner Barrick Gold (NYSE:GOLD) and loaded up on exchange-traded funds tracking the price of gold. The stock purchase, his top stock pick of the quarter, made him the largest Barrick Gold shareholder at quarter end. Barrick is the Soros Management LLC's second largest holding. The fund also purchased over a million shares of silver miner Silver Wheaton Corp. (NYSE:SLW) in the first quarter, stocking up on precious metals typically considered safe havens during economic turmoil. Silver Wheaton's stock, for example, increased 292% from year-end 2006 to year-end 2010, a period where the S&P 500 declined over 11%. Soros likewise has built a sizable derivatives portfolio of instruments that will profit from a decline in the S&P 500. The nature of those investments is less transparent than his common stock purchases, making it impossible to know exactly when and how much the fund has invested. Required regulatory disclosures do reveal large increases in options linked to ETFs tracking the S&P. Year to date, both Barrick Gold and Silver Wheaton have made sizable jumps higher. Barrick is up over 165% since Jan. 1 alone. The S&P 500 has put up marginal gains, rising just over 2.5% over the same period. Can Barrick Gold continue its climb? 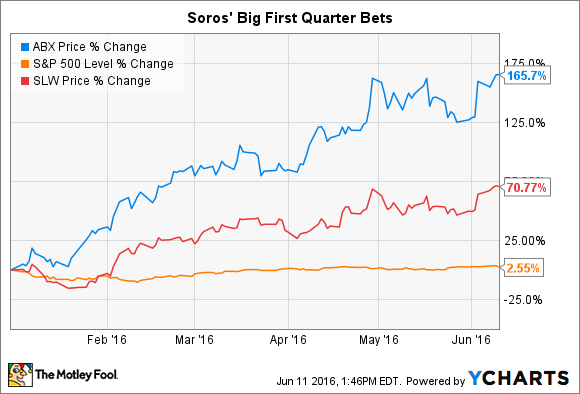 Will Soros' negative expectations come to fruition, sending the S&P lower? It's impossible to know. However, Soros track record speaks for itself, and if nothing else, investors should remain vigilant.